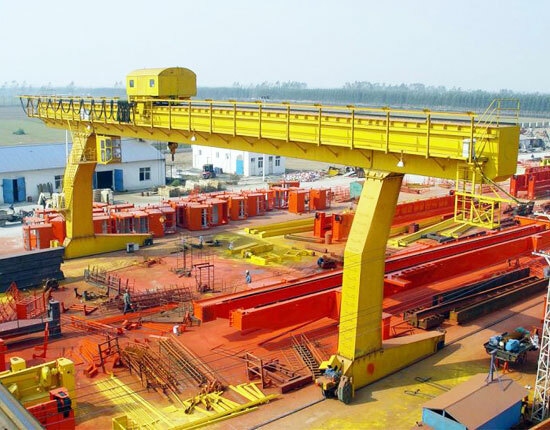 25 ton gantry crane is widely used in many industries, such as manufacturing, railroad, metallurgy, construction, shipyard and port to improve working efficiency as well as realize a highly safe operation. 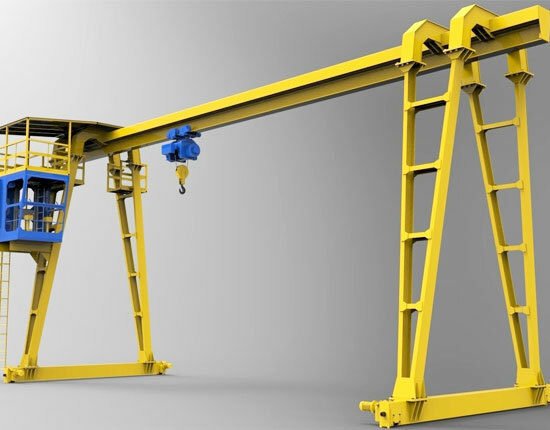 Gantry crane 25 ton, as the name suggests, is capable of lifting and transferring heavy loads up to 25 ton. This gantry crane equipment can be divided into single girder and double girder, and according to the load to be lifted, working environment and frequency of use, we will help you design the most economical solution for your individual applications. 25 ton gantry cranes produced by Ellsen are with superior quality and durable performance due to our constant improvement and optimization. This heavy duty gantry lifting equipment comes in many different types, from which you can find the most appropriate one for your needs. The single girder gantry crane is a cost-effective option for your 25 ton lifting tasks. In terms of the supporting leg construction, the single girder 25 ton crane can be classified into A frame and L-shaped style. 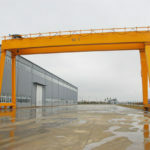 The A frame gantry crane 25t is the most common type used to handle a range of materials, whereas L type gantry crane is more preferred to lift long objects thanks to its structural advantages. Each type has its own pros and cons, thus you should choose according to your practical needs. The double girder 25 ton crane is capable of handling heavy and bulky goods. 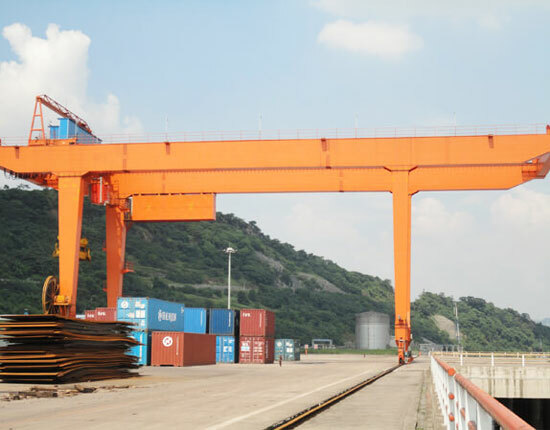 The reliable and durable performance, safe operation and high productivity make it popular among potential gantry crane users. 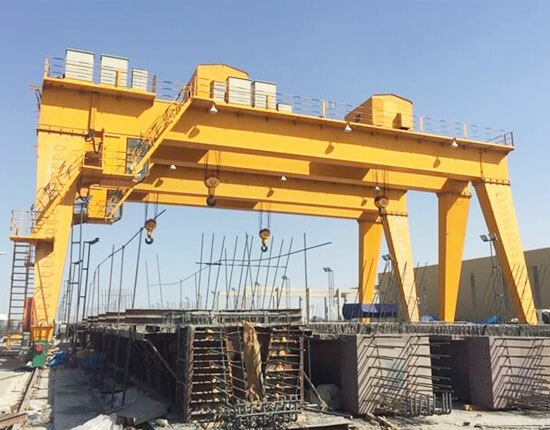 With regard to different types of supporting legs, the 25 ton double girder gantry crane can be divided into A frame and U frame, among which A type gantry crane has a wide range of applications, and U frame gantry crane is an ideal solution to lift and move large items. 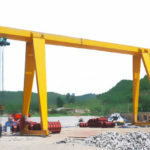 In addition, there are many other types of 25 ton gantry cranes available for you to choose from, such as semi gantry crane, truss gantry crane, cantilever gantry crane and mobile gantry crane. If you would like to purchase a 25 ton crane, contact our sales manager online to get a free quotation. 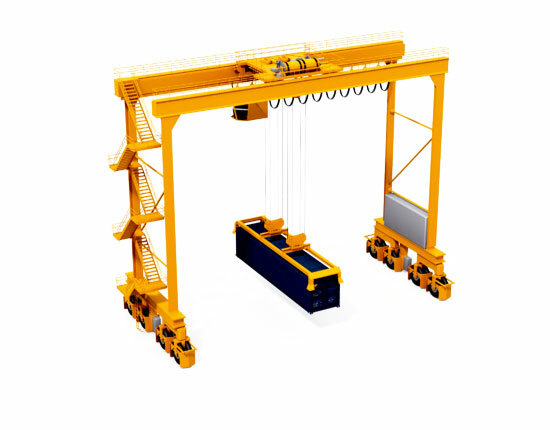 The gantry crane lifting equipment is mainly composed of gantry frame, hoist trolley, crane traveling mechanism and electric control system. The gantry frame consist of main beam, end beam, supporting legs, lower beam, trolley running track and cabin. The main beam adopts box structure and can extend beyond one side or both sides to form a cantilever in order to increase work space. The length of cantilever is generally less than or equal to 1/3 of the span. 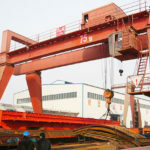 For the ease of transportation, the main beam and end beam are connected by high strength bolts. The design of cabin room takes many factors into account such as various functional requirements, safety and durability. The cabin room is also equipped with several safety devices such as alarm to ensure a safe operation. The trolley mainly consists of two parts, hoisting mechanism and traveling mechanism. 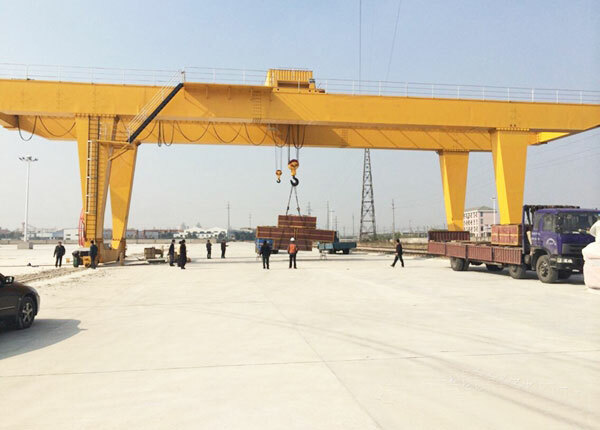 According to different lifting devices, the electric gantry crane can be divided into hook gantry crane, grab gantry crane, electromagnetic gantry crane and gantry crane with carrier-beam. Besides, the hoisting mechanism is usually outfitted with several protection devices, including overload limiter, lifting height limiter, brake and over-speed protection switch. Crane traveling mechanism adopts two or more independent drive systems to drive the crane separately. 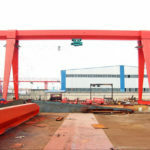 With respect to different working environments, materials to be handled, and ease of use, you can choose either rail mounted or mobile type gantry crane. The electrical device is also designed with various protection systems, including short circuit protection, emergency stop button, overload limiter, zero and interlock protection and limit switch. The crane and its critical components are all brand-new products and designed by utilizing the latest technology. 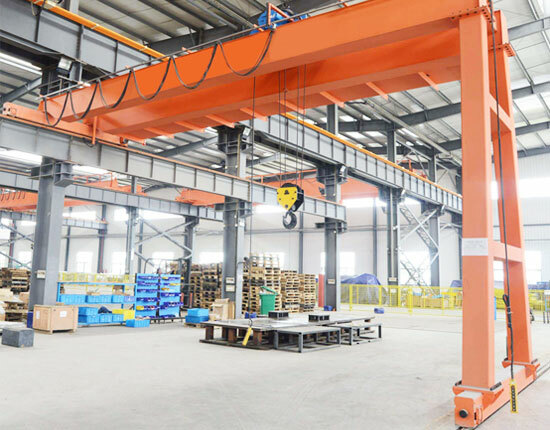 The 25 ton gantry crane is a good alternative to overhead lifting equipment as it does not require additional construction of supporting columns and wall-mounted runway beam. Therefore, it can save a number of construction cost for you. Sturdy structure, quality components and the adoption of protection devices provide highly safe, reliable and durable operation. 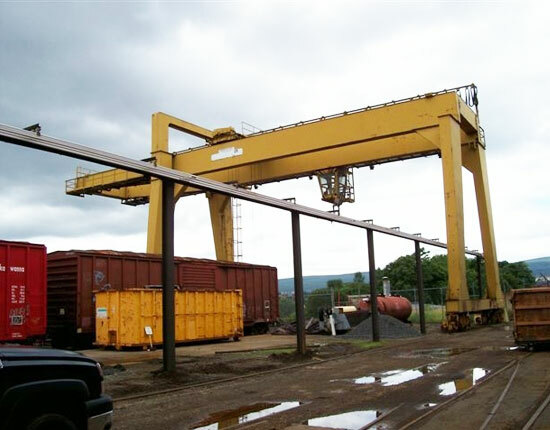 The gantry crane 25 ton can be custom designed and built to suit your special lifting needs. 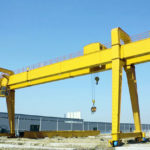 The gantry crane has convenient transportation and can be installed and maintained easily. Gantry crane should be inspected and maintained regularly to make sure it is in a good working condition. Here are some things you should know about taking care of your gantry lifting system. For some critical components that calls for frequent inspection, you should determine an inspection frequency, such as once a month. 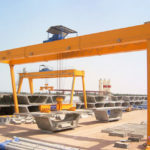 Some factors will help you determine the inspection frequency, including the gantry crane design, the working environment and the frequency of use. A proper inspection will help increase production for your business as well as prolong the working life of the equipment. 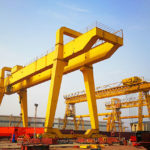 Another important thing is to focus on gantry crane operator training as many crane accidents occur because of human errors. Incorrect operation will not only lead to the equipment failure, but threaten the life of operator. To ensure high productivity, the preventive maintenance is also necessary. If you have any need, contact our customer service online. 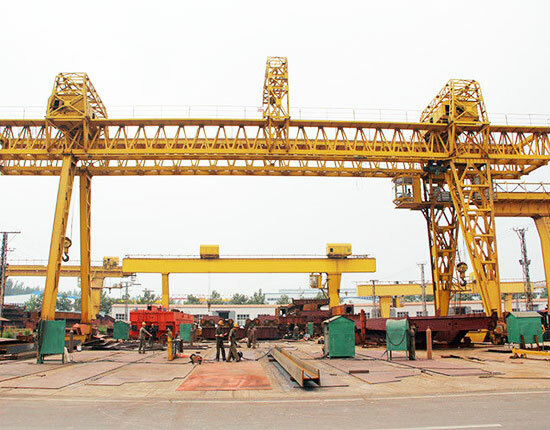 We are seasoned gantry crane manufacturer and supplier as well as a service provider. We have specialized in designing and fabricating lifting equipment for many years and have accumulated rich experience through providing numerous solutions and tackling various lifting issues. We persist in providing quality products and reliable services for clients in accordance with the principle of customer first, quality foremost. The gantry crane produced by our company is in strict compliance with international and national standards and each product is strictly inspected by our specialists in order to ensure the quality of it. Our gantry crane warranty lasts 12 months, during which we provide guidance of crane maintenance and repair in case of equipment failure. To know more about 25 ton gantry crane or other heavy duty lifting solutions such as 30 ton, 50 ton and 100 ton gantry crane, please contact us online directly.